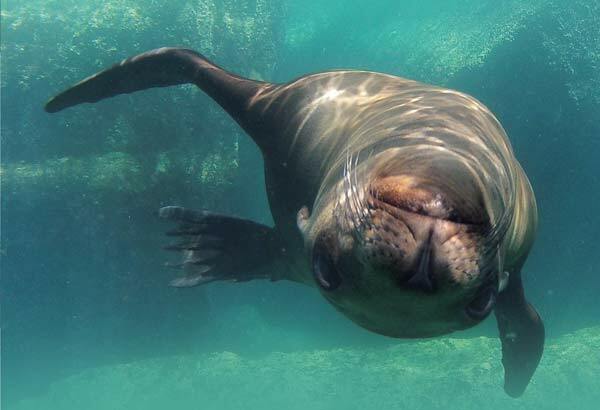 Swimming with seals or sea lions zipping around, tugging at your floaty wet suit zipper string, mouthing the tip of your fins, yanking your snorkel or pressing a whiskered nose against the camera dome, these are diving experiences not to be missed. And a bonus: These delightful diving buddies are readily accessible on the West and East coasts of North America and northwestern Mexico. 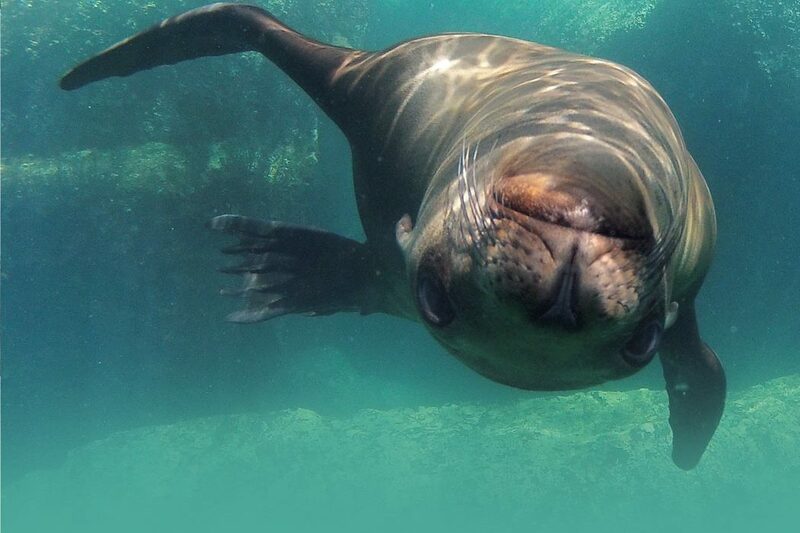 Seals and sea lions belong to a widely distributed and diverse family of marine mammals called pinnipeds, which derives from the Latin pinna, meaning “fin” or “flipper-footed.” Pinnipeds have both front and rear flippers. Although these animals live in the ocean, they are semiaquatic and can survive on land for extended periods of time. There are 35 species of pinniped in the world today; 16 eared, 18 “true” or “earless” seals, and the walrus. Their closest living relatives are bears, weasels, raccoons and skunks. Although widespread worldwide, most pinnipeds prefer the colder waters of the Northern and Southern hemispheres. They spend most of their lives in the water, but come ashore to mate, give birth, molt, or escape predators, such as sharks and killer whales. Eyesight and hearing are adapted for both water and air, and their whiskers serve as tactile sensors to help locate prey. Some pinnipeds are adapted for deep diving, and all have a layer of fat, or blubber, to help stay warm in cold water. All but the walrus are covered in fur. Earless seals are called the “true” seals, or phocids. They are identified by their ear holes that have no external ear flaps, small front flippers and their method of locomotion on land. Because of the small flippers, seals on land undulate on their bellies, like a caterpillar. In water, seals flap their rear flippers side to side, like a fish tail. Eared seals, or otariids, include sea lions and fur seals. (Fur seal is actually a misnomer, as these pinnipeds are closely related to sea lions.) Eared seals have external ear flaps, large front flippers, and are agile on land. They can bring all four flippers under their bodies and walk. In water, they use their large and powerful front flippers like paddles to propel themselves. Walruses are one of the largest pinnipeds, with males reaching weights of more than 3,000 pounds (1,361 kg). They are called odobenidids and are the only species in this group of seals, noted for their large tusks and abundant facial whiskers. Walruses live in the Arctic and subarctic seas of the northern hemisphere. Hunted relentlessly for their meat, fur and blubber, seals and walruses eventually achieved protected status under international law. (Limited hunting of walruses by the Inuit is allowed.) Measures were too late for the Japanese sea lion and Caribbean monk seal, both of which became extinct in the last century. The Hawaiian monk seal is teetering on the edge of the same fate. Pinnipeds, classified as carnivores, are far-ranging in their food preferences. Most feed on fish and marine invertebrates. 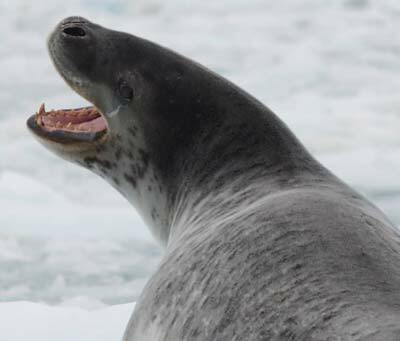 Specialists, such as the leopard seal, feed on larger prey, such as penguins and other seals. Walruses and elephant seals dive deep to hunt bottom-dwelling mollusks. Seals in general are vocal, ranging from the barking of California sea lions to the bleatings made by hungry pups, to the complex songs of Weddell seals and the odd gong sound of walruses. Not counting the Arctic walrus, seven species of pinniped can be found along the western and eastern coasts of North America and northwest Mexico. An eighth species, the endangered and rare Hawaiian monk seal, is found in Hawaiian waters. Pacific harbor seals are the smallest of the common West Coast pinnipeds, reaching a length of 5 to 6 feet (1.5 to 1.8 m) and reaching a weight of up to 300 pounds (136 kg). They have a distinctive spotted coat with color variations from silver-gray to dark brownish black. They are true seals, with no external ear flaps and weak flippers on land, causing them to undulate on their bellies. Their range extends from Alaska to Baja, California, Mexico. Harbor seals prefer near-shore coastal waters and can be spotted on rocky islands, sand beaches, mudflats, bays, and estuaries. They divide their time evenly between land and water and can dive up to 1,500 feet (457 m) deep and remain submerged for up to 40 minutes. 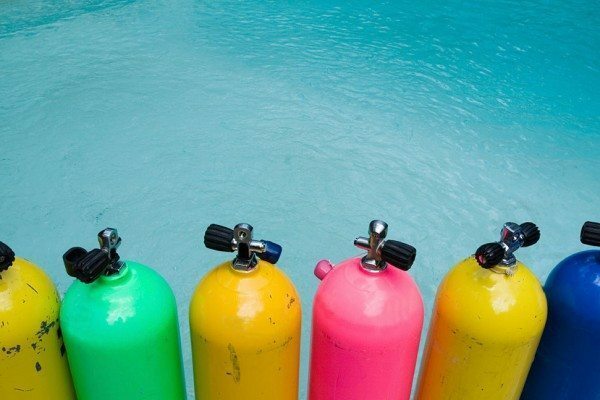 The average dive is 3 to 7 minutes and much shallower. They feed on a wide variety of fish, octopus, and squid. Although curious and bold in the water with divers, they are less comfortable with people on land, and will leave the beach or even abandon their haul-out spot or their pups if they are disturbed. Good places to view harbor seals include Elkhorn Slough in Watsonville, California, and La Jolla, California, at a beach called Children’s Pool. This harbor seal haul-out and pupping location has become a tourist attraction, but is not without controversy. Some locals want to reclaim the beach for human use, while others want the beach protected from humans during pupping season. California sea lions are perhaps the most doglike of the pinnipeds, their nose and teeth somewhat resembling those of a German shepherd. They even bark like canines and are as intelligent and playful as your favorite pup. Sea lions have external ear flaps and strong flippers on land, allowing them to walk relatively easily. They can also be found floating in the water in large groups called rafts. Males can be 7 feet (2.1 m) long and weigh up to 800 pounds (363 kg), with females smaller at 6 feet (1.8 m) and over 200 pounds (91 kg). Males are brown and females are slightly more golden. The mature male has a distinctive bump on the top of his head, the sagittal crest. Their range encompasses British Columbia to the tip of Baja, California, Mexico, as well as offshore islands such as the Farallons off San Francisco, California’s Channel Islands, and the Coronado islands near San Diego in Mexican waters. 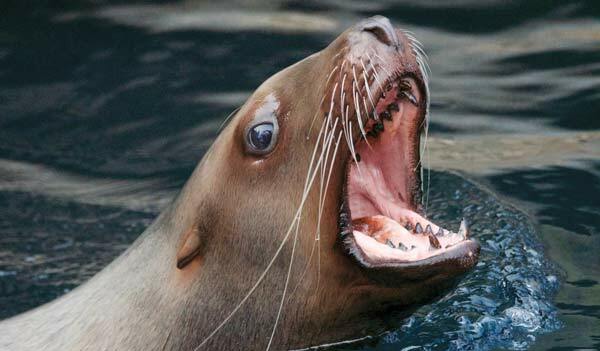 Sea lions eat a wide variety of fish, small sharks, squid, and octopus and are preyed upon by killer whales and great while sharks. Places to easily view sea lions include Pier 39 in San Francisco, the Coast Guard Jetty in Monterey, California, and The Cove in La Jolla. One of the best places to interact with sea lions in the water is Los Islotes, a cluster of rock islets close to Isla Esperitu Santo, about an hour boat ride from La Paz, Baja California, Mexico. On the surface of the water, sea lions can sometimes be seen “porpoising,” swimming fast, and leaping out of the water, just like a porpoise. While resting on the surface, they hold flippers out of the water to warm in the sun and air. The warmed blood travels to their body core to help keep them warm, a process called thermoregulation. A large group of Steller sea lions heading at you at high speed in murky green water is quite a thrill. They are known to be very “mouthy” with divers, and there is not much you can do about it except enjoy the experience. Steller sea lions are the “big boys” of sea lions, think of a sea lion on steroids. If you dive in Alaska or British Columbia you will likely encounter and or even be mobbed by these inquisitive, playful, and very large sea lions. Dive operators on Vancouver Island, British Columbia, offer dive trips to swim with Stellers at colony sites. The sheer size and lighter color distinguish Stellers from the California sea lion. Males reach 11 feet (3.35 m) and 2,500 pounds (1134 kg), while females are a mere 9 feet (2.7) and 1,000 pounds (454 kg). The male Steller does not have the sagittal crest bump on its head that is characteristic of the mature male California sea lion. Stellers range from the coastal waters of the North Pacific Ocean, Japan to central California. They eat a variety of fish, invertebrates, and an occasional other pinnipeds. They are preyed upon by killer whales and great white sharks. Northern elephant seals are easily recognized for their unusual nose and size. They are the second largest seal in the world, the southern elephant seal being larger. The northern elephant seal range extends from the Aleutian Islands to Baja, California, Mexico. The male reaches lengths of 13 feet (4 m) and weighs up to 4,500 pounds (2041 kg). Mature males sport a nose resembling a short, thick elephant-like trunk. The smaller female reaches lengths of 10 feet (3.5 m), weighs in at 1,300 pounds (590 kg), and has a much prettier face with a more normal nose. Being true seals, they lack external ear flaps and move on land by flopping on their belly. Except for breeding, pupping, and molting, elephant seals live offshore, diving up to 5,000 feet (1,524 m) deep for deep-water, bottom-dwelling marine life. Elephant seals were hunted to near extinction, primarily for their blubber, which was processed into lamp oil. By 1910 only 100 animals remained, all on Guadalupe Island, Mexico, according to the Marine Mammal Center. Luckily for us, conservation of the animals has been a success. Elephant seals, can be viewed at protected rookeries at Año Nuevo State Park at Pescadero, California, and at the Piedras Blancas elephant seal rookery near San Simeon, California. At Mexico’s Coronado islands near San Diego you might even see one while diving. Almost every pupping season a young and perhaps lost or tired elephant seal finds its way ashore with the harbor seals at Children’s Pool, La Jolla. To plan a visit to a rookery and learn more about these amazing animals, Friends of the Elephant Seal, elephantseal.org is an excellent resource. Northern fur seals, like other fur seal species, are noted for their especially thick fur, hence the European nickname “sea bears.” It is these luxurious pelts that almost caused the extinction of fur seals. As a result of extensive hunting in the 1800s, northern fur seals were extirpated (made locally extinct) on California’s Farallon Islands, west of San Francisco. Researchers and conservationists rejoiced when a pup was born there in 1996, the first in over 100 years. Eighty pups were born in 2006, and the Farallon rookery is now considered to be established. Like the other fur seals, Northerns are eared seals that are closely related to sea lions. Fur seals can be distinguished from sea lions by their pointy nose and huge, dark eyes. Males reach 7 feet (2.1 m) and 600 pounds (272 kg). Females, much smaller, measure 4.5 (1.37 m) feet and about 100 pounds (45 kg). Their range extends throughout the Pacific Rim, from Japan to the California’s Channel Islands. The main breeding grounds are found in the Bering Sea, as well as a few smaller colonies on remote offshore islands, including Southern California’s San Miguel Island. They live most of their lives in open sea, coming ashore at remote islands for breeding and pupping. They feed primarily on small, schooling fish and dive to an average of 200 feet (61 m) deep. Northerns are nfpoted for sticking all four flippers out of the water while sunning on the surface. This helps with thermoregulation of their body temperature. Northerns are never seen on mainland beaches unless sick or injured, according to the Marine Mammal Center, a rescue and rehab center located in Marin County, near Sausalito, California. The educational facility is open to the public for tours, marinemammalcenter.org. Guadalupe fur seals are found on Guadalupe Island, Mexico, 200 miles south of San Diego. The island is most famous for its seasonal encounters between caged divers and great white sharks. As with other pinniped species, Guadalupes were hunted to near extinction for their fur. Fortunately, cooperation between the U.S. and the Mexican governments allowed the seals to recover, with the current population at about 7,500 animals. By U.S. and Mexican laws, Guadalupe Island is a pinniped sanctuary. 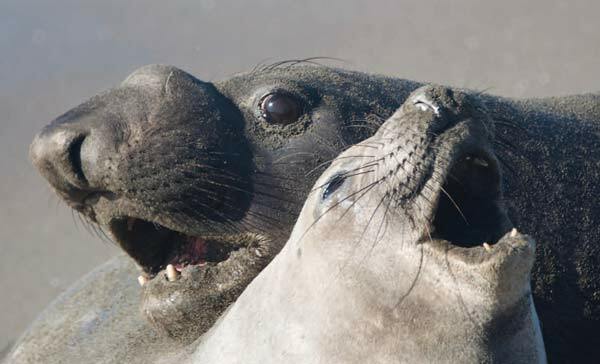 (For more on pinniped protective laws, see sidebar, Marine Mammal Protection Act.) Little is known about the life history of Guadalupes, as they were nearly extinct before researchers took notice. 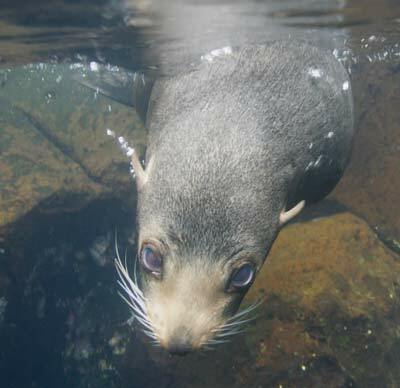 Like the other fur seals, Guadalupes have external ear flaps and are closely related to sea lions. Males reach 6 feet and 300 pounds (136 kg), with females reaching 4 feet (1.2 m) and 100 pounds (45 kg). Guadalupes once ranged as far north as central California, but became extirpated in California waters in 1825. Today, the only known breeding colony is on Guadalupe Island, but there is hope that the seals will reestablish their natural range into California. A few are now occasionally found off of the California coast, according to the Marine Mammal Center. Guadalupes live most of their lives in open water, coming ashore only to breed and pup. Hawaiian monk seals are one of the most endangered marine mammals in the world and the rarest seal in U.S. waters. It is the only seal endemic to Hawaii, and one of only two endemic mammals, the other being a bat. Worldwide, the Hawaiian monk seal is one of only two monk species extant, the even rarer Mediterranean monk seal being the other. A third species, the Caribbean monk seal, was last seen in the 1950s and was declared extinct in 2008. Only a remnant population of the Hawaiian species remains, the result of past commercial hunting for their skins. They get their name from the short hairs on the top of their head, said to resemble a monk. I have also heard, perhaps an apocryphal statement, that their name derives from their solitary, or monk-like behavior. A population estimated at 1,100 lives on six main breeding grounds in the Northwestern Hawaiian Islands. Monks can also be found in much smaller numbers on the main Hawaiian Islands. Their Hawaiian name, “llio holo I ka uaua” means “dog that runs in rough water.” Males are can reach 7.5 feet (2.3 m) long and weigh about 400 pounds (181 kg). Females are slightly larger. They are silvery gray going to cream on their undersides. Monks feed on a wide variety of fish, cephalopods and crustaceans. They in turn are hunted by tiger and Galapagos sharks. Monk seals breed in the water, hauling out to give birth. The mother does not leave the pup for the six weeks that it nurses on shore. The Marine Mammal Center has opened a facility at Kailua-Kona on the Big Island, Ke Kai Ola (the Healing Sea in Hawaiian) to monitor, rescue, and rehab monk seals and to educate the public. Challenges to the survival of monk seals include human encroachment, lack of genetic diversity, low juvenile survival rates, gender disparity (more males than females surviving), and entanglement in fishing nets and other marine debris. Gray seals are the East Coast members of seal family, and have the most interesting Latin name, Halichoerus grypus, which means “hooked-nose sea pig.” (This description makes me think that the person who named gray seals was not all that fond of the sea and its denizens.) A true or “earless” seal, it is found on both sides of the North Atlantic Ocean. In North America, the seals can be spotted from Newfoundland to New Jersey. In the past, they ranged as far south as North Carolina. Gray seals can be found year-round off the coasts of Maine and Massachusetts. In winter months they haul out on to rocky promontories and beaches. Western Atlantic males can reach 10 feet (3.5 m) in length and 900 pounds (408 kg). Females are smaller at 6 feet (1.8 m) and 500 pounds (227 kg). Although they share silvery-gray and black spotted fur with the harbor seal, their sheer size, large head, and prominent nose distinguish them from their smaller spotted cousins. In the U.S. gray seal populations are on the rise, resulting in local conflicts at popular summer swimming spots such as Cape Cod, where some fear that the abundance of seals might attract predators such as the great white shark. Like sea lions, gray seals are intelligent and playful, and adapt to captivity. They are common zoo and circus animals in Europe. I have encountered pinnipeds all over the world. In the Galapagos, I spent a delightful afternoon gamboling in shallow water with young Galapagos fur seal during a birding trip to the Enchanted Isles that included daily snorkeling. On a land-based birding walk we encountered a Galapagos sea lion and her pup resting on the beach. Like other Galapagos species, the sea lions had little fear of humans and allowed very close encounters. On a birding trip to Patagonia’s Straits of Magellan, we encountered leopard seals while exploring in a Zodiac inflatable. The leopards were resting on ice floes in a remote bay, with spectacular snow-capped mountains in the background. Quite unintentionally, the nose of our inflatable bumped gently against the edge of an ice floe, on which reclined a large leopard seal. The massive, spotted head lifted slowly up off the ice and turned toward us. The seal made eye contact then bared its numerous large, sharp, pointy teeth in a clear message to “back off.” The seal was as long as our boat, which suddenly felt very flimsy and fragile. Their mouth is so large that their head appears to almost split in half: perfectly adapted for grabbing penguins and other seals for a meal. I was very happy when our Zodiac drifted back from the ice floe and its possessive passenger. In the chic beach community of Viña del Mar, Chile, not far from the historic shipping port of Valparaiso, I nearly stepped on a bulky, huge-headed male South American sea lion. I had spotted some interesting birds on a rock in the ocean, and did not realize as I crossed the small sandy beach that the large, unmoving rock at the water’s edge was actually a gigantic and very cross male South American sea lion. The “rock” suddenly lunged and I ran back to a safe distance. My birding buddies back on the sea wall were thrilled: they were getting great action shots of the sea lion. My buddies soon joined me on the beach to photograph the huge male holding a smaller female hostage. No matter how hard she tried, he would not let her rejoin the sea lion colony on a large rock a little further out to sea. We all felt pretty sorry for the lass as the big boy squashed her flat into the sand with his bulk, fighting and biting and roaring. As long as we are talking about seals, mention should be made of the sea otter. They are not pinnipeds, despite similarities in appearance and behaviors. Sea otters are a marine mammal of the mustelid family, meaning they are big, ocean-going weasels. As marine mammals go, sea otters are on the small side, about 100 pounds (45 kg). But as weasels go, it is the largest member of that family. Sea otters are native to the northern and eastern coasts of the Northern Pacific Ocean. Good places to see sea otters include Monterey Bay and Elkhorn Slough, Watsonville, California. As a result of extensive fur hunting, the sea otter population plummeted to around 1,000 to 2,000 animals worldwide. 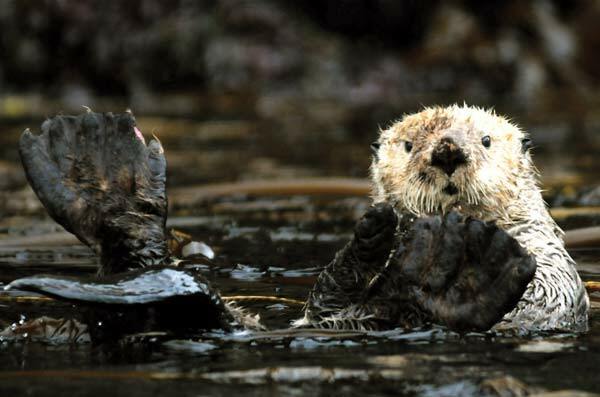 Numbers are rebounding and sea otters are reclaiming their historic range. Sea otters are a keystone species, necessary to help control sea urchin populations that would otherwise damage kelp forest ecosystems. Unlike pinnipeds, sea otters do not rely on a layer of blubber to keep warm. Instead, they depend on extremely dense fur that requires lots of grooming to keep the animal waterproofed and dry. Although sea otters can walk on land, they spend most of their time in the ocean. My favorite sea otter experiences at Elkhorn Slough include watching them hold a flat rock on their chest to crack open mollusks, then wrapping themselves in floating kelp for a snooze. Sea otters enjoy some of the same prey species that humans eat, leading to conflict with the fishing industry. So there you have it. Diving with a furry buddy can be a really enriching and fun experience. How lucky are we as divers to be able to interact so closely with wild marine mammals. While I will never harass or disturb a seal or sea lion on land or in the water, I have no problem at all if a seal lion or seal decides to “harass” me during a dive! And by harass I mean swimming graceful loops around me, tugging at my wet suit zipper string, mouthing my fins and sticking a nose against the dome of my camera housing. As with any activity involving large, toothed marine creatures, it’s a good idea to observe some basic safety rules. You want to have a positive experience for both you and the pinniped. But, Higuera cautions, “Always keep an eye on the big males, they are quite territorial and if they don’t want you nearby or around their harem of females or their pups they will start approaching closer and will bark at you while showing you their teeth. Once they do this it is time to back off.” Barking underwater also releases bubbles, another sure sign that you are too close for the comfort of the animal.